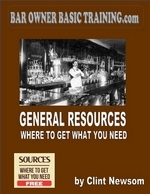 FREE PREVIEW OF "My Own Bar"
The "My Own Bar" series includes manuals you purchase (Click on the links to the far right) . These are very comprehensive volumes to walk you step by step through what it takes and what it means to own your own bar. In fact, anyone who has or is planning to start their own small or large business will benefit by the knowledge and planning that this series represents. The Guides that are listed above and below I offer to you for free that you may get an idea of what I have put into creating this series and that you may understand that this venture is not to be taken lightly or to be relegated to the trash bin of make it rich schemes that we see too often floating about the internet. Click on the specific cover to link to the specific page to download one of these free guides to help you get started.